Now that it’s Mother’s Day, it’s time to reminisce about old memories. It’s also a good idea to do everything you can to prevent your mother from having a heart attack due to some kind of scary looking pest or insect in the house. Give you mom a gift she deserves- a pest free home. Pests (animals, plants, insects) do considerable damage to your home and your health. There are many ways to kill pests, but only a few of them are actually effective. In many circumstances, bug bombs don’t actually kill the bugs (because they run away). You need to approach the problem with targeted strategy to eradicate these pest offenders. 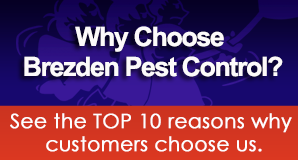 A Brezden Pest Control Technician will tell you how they’re getting in, where they’re coming from, and how to get rid of them. Pest Control Tip #1: Remove sources of moisture to get rid of ants that might ruin your picnic. Ant’s can’t survive if there’s no water outside. They are also attracted to (and eat) rotting wood. As springtime and summer roll around, remove piles of wood that have accumulated around your home. Check for ant hills under pots, logs, and in cracks. Seal and caulk all cracks and crevices to help keep them out. Pest Control Tip #2: Always winterize your home or the bugs and other pests will come in to escape the cold. To prevent entry, caulk and seal all cracks and holes in the foundations, walls, windowsills, and doors. Empty out your shelves and drawers of unwanted paper or cardboard. Pest Control Tip #3: Inspect your old decorations before you bring them into the house. Most all decorations that have been outside could very well hide cockroaches, spiders, and other bugs. To minimize the possibility of spreading pests through your home, wrap all tall boxes and containers up before you move them, and look for any signs of bug life such as cobwebs, droppings on the ground, or teeth marks in electrical cords. Pest Control Tip #4: If you see a skunk, just walk away. Skunks are generally friendly, peaceful creatures. When provoked, things tend to get a little messy. If you’re confronted with a skunk, it’s best just to call your local pest control professionals. If you get sprayed, wash yourself in hydrogen peroxide, baking soda and lemon juice (instead of wasting good tomato soup). You can keep skunks away by getting rid of food and putting up mesh fencing 6 inches under your fences. Noises, herbs, spices and bright lights can discourage skunks too. Pest Control Tip #5: If you’re trying to dose your pets for fleas or ticks, avoid using human repellents, and follow dosing instructions exactly. Human bug sprays have very harmful chemicals in them that can easily shut down your pet’s kidneys due to poisoning. Even when the vet gives you medicine, only administer the exact dose to not only inhibit pest control (fleas and ticks) but prevent causing issues for your pet. Even after your pet gets vaccinated or starts taking medication, keep an eye on them to ensure they aren’t going to have reactions. Pest Control Tip #6: If you’ve got a bat, bird, or squirrel problem in your attic just block their access to kiss them goodbye. Squirrels, pigeons, owls, and bats all congregate in your attic. One or two bats or birds might not seem like a big deal, but they cause a huge mess and begin to congregate if left untreated. Bat guano and other bird feces can be harmful, even toxic, so wear gloves when you’re cleaning it up and when you’re blocking your attic off with wire or planking. It’s also important to prevent being bitten, because bats can sometimes carry serious illnesses (like rabies). Hopefully these helpful tips provide insight on the best ways to handle pests, rodents, and other intruders on your property. If you smell anything rotten or fear an infestation, don’t wait for it to go away. Call us today for a quote. Handling the problem now eliminates many costly repairs down the road.